Whether it’s wall mounted or freestanding, electric fireplaces make a super stylish focal point and keep you toasty, too. Featuring a range of flame effects and intensities, the best electric fireplaces will give you the freedom to create a range of ambiances while emitting different levels of warmth. When it comes to electric fireplaces, Dimplex usually come up tops. The Dimplex Optiflame Electric Stove has earned first place in our list, due to its traditional freestanding design and choice of either log or coal effects. Endeavour are also a fantastic brand to consider when looking for an electric fireplace, as their fireplaces are often modern, rather than traditional in their appearance. Aside from choosing between wall mounted or freestanding, look out for different technical features. A fireplace like the Endeavour Fires Holbeck Electric Fire features a thermostat and an intelligent remote control that can turn the fire on and off in relation to the room temperature. Some even feature flame colour and brightness intensity controls so you can create the perfect ambiance. If you’re tired of your drafty chimney or hoovering up ash from your open fireplace, the Dimplex Optiflame allows you to retain your home’s original features while making it more energy efficient. The stove itself retains the authenticity of a traditional coal or log burning stove, with the option to choose either effect depending on your personal preference. With multiple heat options, including the option to keep the flame on without the heat, the stove uses a thermostat for optimum heat efficiency and temperature control. For larger living rooms, a fireplace suite can become that centrepiece attraction that draws the eye. This Endeavour electric fireplace is certainly more than it seems, with 13 different backlights to choose from which frame its flaming focal point. Similarly to our second pick, this fireplace features a thermostat and an auto on and off function for when the temperature in the room dips and 5 brightness levels so you can create the right ambiance for your lounge. Coal fireplaces were a common feature in many houses that were built during and after the 19th century. This Dimplex electric fire puts a modern twist on the original, allowing you to benefit from the traditional appearance of a coal fire without the dirt, soot or even an existing fireplace. 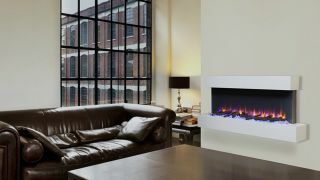 If you like the idea of a wall mounted electric fire but find our previous pick too modern, this one from Dimplex is a great compromise. It may be simpler in its functionality and lacks a remote control but it’s low cost reflects this. Modern in appearance and modern in functionality, this energy saving electric fire is certainly worthy of taking centre stage. Featuring different coloured flame effects and an authentic log and pebble bed, this Endeavour blends the modern with the traditional to help you create the perfect blend of style and ambiance. Tech wise, it includes a temperature sensing remote control, open window detection and different brightness levels for both the flame the background mood lighting. Looking for something a little more portable or a little more temporary? Cast your eye over our pick of the best electric blankets for the living room, bedroom, or even the car.